Olivier graduated as MSc in systems engineering, policy analysis and management at Delft University of Technology on the topic of discrete simulation models as support for continuous process improvement. Throughout his career he worked in various industries, always in roles responsible for both business strategy/process improvement on the one hand and IT development on the other, leading operational and IT teams. During his executive MBA at Nyenrode/Kellogg/Stellenbosch he started in the banking industry. In that time he first came into contact with blockchain and immediately saw the potential, so here the blockchain deep dive journey started. Things have been moving fast ever since. For the past two years he has been working full time as blockchain and smart contract expert with in-depth knowledge of Ethereum. 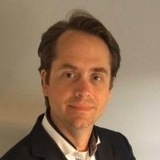 Besides working as consultant at AXVECO, he is the chairman of the Smart Contract workgroup of the Dutch Blockchain Coalition, entrepreneur working on an Ethereum based insurance concept, advisor for the Ethereum start-up SwarmCity and advises various blockchain start-ups on the background.